This easy slow cooker recipe combines hot dogs and homemade barbecue sauce for a delicious twist on the quintessential party food recipe of sweet and spicy cocktail wieners. 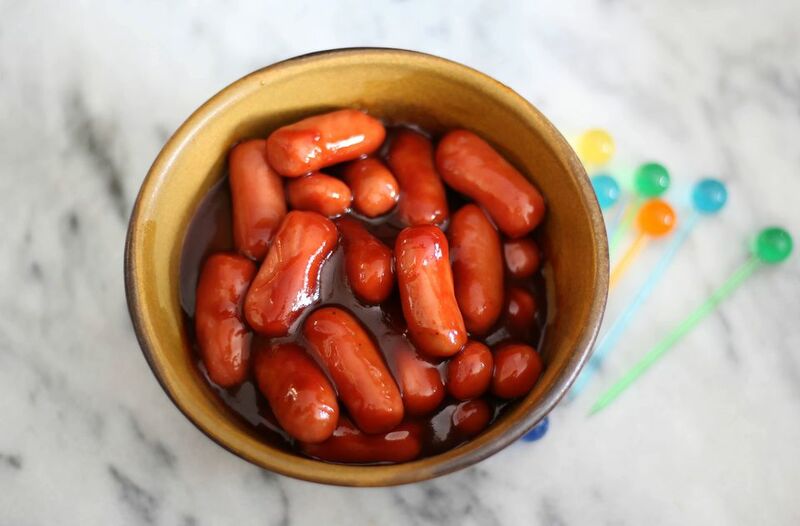 Popular in the 1970s, this combination of mini hot dogs and thick and dark-colored piquant sauce has still held strong as an easy appetizer that everyone seems to love. This recipe keeps the flavor profile somewhat simple, focussing on the tastes of barbecue sauce and eliminating any use of spice. Of course, you can use your favorite bottled barbecue sauce, but considering how easy this recipe is, it makes sense to control the ingredients so you know exactly what is in the dish. You can use sliced hot dogs, cocktail franks, or little smokies. Just put it all in the slow cooker—all you need to do is provide the toothpicks and napkins. If using regular hot dogs, cut into bite-size pieces. Place franks in a crock pot. Combine remaining ingredients in a measuring cup or bowl and pour over hot dogs. Cook on LOW for 3 to 4 hours, or on high for 1 to 2 hours. Serve from the crock pot, with the temperature set on low. If these barbecue cocktail franks are the hit of the party, you may even want to add some other recipes to your repertoire. The next time you have guests over, try this sweet and spicy mini hot dogs that cook in the crock pot, or little smokies in a spicy sauce. And, as we all know, everything is better with bacon—and bacon-wrapped mini hot dogs in a maple-brown sugar sauce is proof of just that.